Stephen Fidel’s Cosmic Evolution turned back a powerful trio of fillies trained by Steve Asmussen to score her first career victory in a 1 ½-length triumph the $100,000 Debutante Stakes for 2-year-old fillies on Saturday, June 27 at Churchill Downs. Cosmic Evolution, the 5-1 fourth choice in the Debutante, paid #$12.60, $3.20 and $2.80. Adhara, ridden by Corey Lanerie, returned $2.80 and $2.20. Areolite, who had beaten Cosmic Evolution in her prior start in the career debut for both fillies, finished third as the 2-1 second choice under Julien Leparoux and paid $2.20 to show. 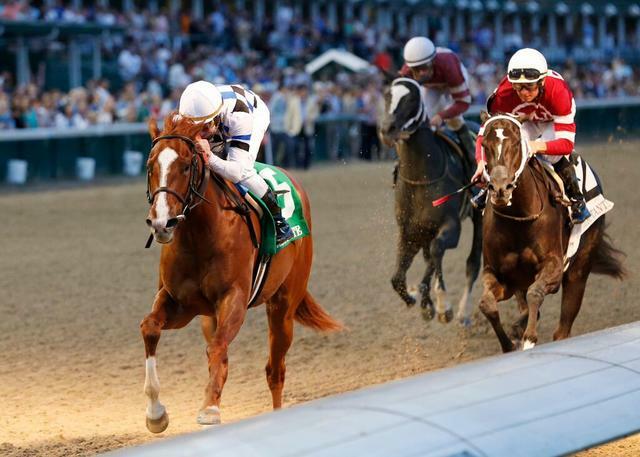 The third Asmussen-trained filly and third wagering choice Thievery finished fifth. Cosmic Evolution’s Debutante win improved her record to 1-1-0 in two races and the $60,760 winner’s share of the $100,000 purse improved her bankroll to $69,560. Tia Chuy finished fourth,12 lengths ahead of fifth-place Thievery. Sheza Fine Justice and Langstars Charmer rounded out the field of seven. Don’t Boss Me was a late scratch. LON WIGGINS, trainer of COSMIC EVOLUTION (winner): “She broke sharp; that really helped. And Calvin (Borel) got her to relax good. When he called on her she came running. CALVIN BOREL, jockey on COSMIC EVOLUTION (winner): “I’ve been working her. You know, we got beat the first time but she needed it. I came back and told Lon (Wiggins) that those horses would never beat her again. She stood up to the plate. “She was trying to drift a little bit with me today. Maybe she was a little bit anxious because, boy, she wanted to run early and I didn’t want her in front today. She relaxed under me and where I wanted her. When I asked her she went on like a good horse. That’s the way you do it. “Lon told me to do what I want. … We’re worried about the future and down the road where we know she can finish.